Ongoing Classpacks: are Classpacks which DO NOT have an end-date. In the ongoing classpacks credits are pre set by the business owner. And one credit can be used to book one class. Example: 4 classes available for 4 weeks and are priced at $100. 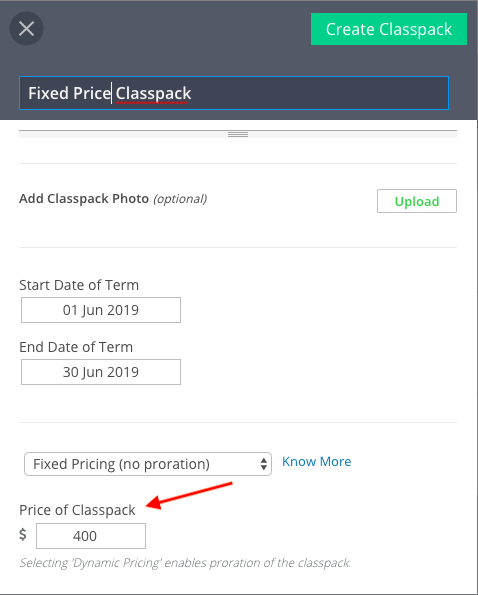 While on the ongoing classpack, you could also enable auto-pay (auto-renew) which will let you auto renew the classpack subscription for the clients who've booked the same. Fixed Pricing: The business owner decides the fixed price for the classpack. Example: Summer Camp, starts 1st June 2019 and ends 30th June 2019 is priced $400. Even if a client books it in the middle of the camp (let's say on 15th June 2019), they will be paying $400. There is no PRO-RATION involved. 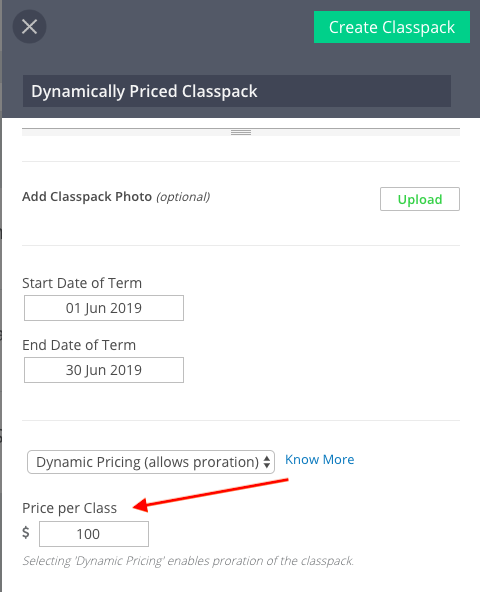 Dynamic Pricing: With Dynamic pricing you can price the classpack flexibility. You have to enter a price per class as opposed to the price of the classpack. This means it allows you the option of PRO-RATION. In this case a client will only pay for the number of classes that are available. Example: Summer Camp, starts 1st June 2019 and ends 30th June 2019 and has 4 classes. And the price per class is $100. In this case, if a client books while all 4 classes are available, they will be paying $400. Otherwise, if they book in the middle of the camp while say, only 2 classes are available, they will be charged $200 (and not $400). This provides your clients with the flexibility to pay only for what services are available for them to book along with the classpack depending on when they purchase the classpack. In case, you have any questions, just drop us a line via the chat icon.